Manitoba Conservation and Water Stewardship requested an independent review to assess the ecological and sociological carrying capacity of commercial polar bear ecotourism operations around Churchill, Manitoba. An assessment of the current situation revealed three fundamental recommendations to help improve management. Polar bears are an iconic species for the province of Manitoba and town of Churchill. The town has a long history of interactions with polar bears which includes a tourism industry that has been in operation since the 1970s. In recent years, between 6,000 and 10,000 visitors are drawn to view polar bears. Tourism peaks in the late fall as polar bears congregate close to the shoreline waiting for ice to form on Hudson Bay in an area known as the Churchill Wildlife Management Area (CWMA), a provincially managed landscape less than 10 km east of Churchill. 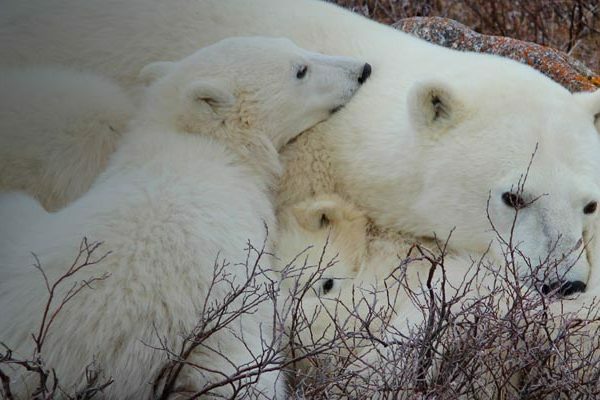 Two companies are permitted by the provincial government to operate tundra vehicles along a designated off-road trail network in the CWMA for the purpose of providing polar bear viewing opportunities to tourists. For many years the number of permitted off-road tundra vehicles has remained the same. In 2014, Manitoba Conservation and Water Stewardship requested an independent review to assess the ecological and sociological carrying capacity of commercial ecotourism operating in the designated off-road trail network. The specific goals of this review were to: (1) assess the cumulative impacts of tourism activities; (2) identify the amount of tourism use that can be supported; (3) determine the ecological and social carrying capacity of the area; and (4) understand the implications of climate change on the area’s carrying capacity. This research involved a stakeholder engagement process to gather input from a variety of perspectives and a synthesis of existing knowledge about the impacts of climate change and human stressors on polar bears. This review used a multi-criteria decision making approach to this assessment which recognizes that identifying the carrying capacity of the area can not necessarily be defined as a single limit on tourism. Multiple limits may exist for which the preference among them depends on what stakeholders want and the balance of benefits and costs that decision makers deem appropriate. This work identified a set of key findings about the social and ecological carrying capacity of the region, which were then used to develop a set of recommendations to improve the operation and management of tourism activities in the Churchill Wildlife Management Area.